FEAR and loathing were mobilised by DUP Culture Minister Edwin Poots this week as he moved to scupper the proposed Irish Language Act. Financial scare-mongering and the promotion of an anti-Irish campaign underpinned the minister’s position. Announcing his decision on Tuesday to recommend scrapping the act, Poots cited cost and the current political climate. These factors, claimed Poots, militate against the introduction of the kind of modest legislation already accepted in relation to the Welsh language in Britain. Other factors, which by any reasonable expectation should have commanded more consideration, were ignored or dismissed by the minister. When an initial consultation process resulted in 90 per cent in favour of a response, Poots ordered a second consultation process. The subsequent process resulted in a reduced but still significant response in favour of 65 per cent. Clearly at odds with the DUP minister’s determination, results of the consultation process were ignored. The last Census revealed 75,000 people in the North who can speak, read and write in Irish with a further 167,000 with some knowledge of Irish. The increasing demand for Irish-medium education is also a statistical indication of support for the legislation. But the minister decided the political climate was unfavourable and anything at odds with that evaluation was to be rubbished. Speaking during an Assembly debate, Poots questioned the ‘accuracy’ of the Census and queried the fluency of people recorded as Irish speakers. Earlier this month, a spurious claim by DUP MLA Sammy Wilson of discrimination against non-Irish speakers in relation to practice transfer test papers was topped only by DUP MLA Gregory Campbell’s display of offensive racist mockery of the Irish language in the Assembly chamber. Meanwhile the UUP attempted to out-jockey their electoral rivals by pre-empting Poots’s decision. UUP MLA David McNarry tabled an unsuccessful motion calling for a ban on the use of Irish in the Assembly. Earlier, UUP Health Minister Michael McGimpsey unilaterally moved to restrict the use of Irish in his department. 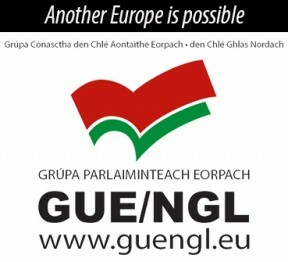 Irish-language groups expressed concern that language rights are being used as a political football by the two main unionist parties playing out their electoral rivalry by appealing to the worst elements of anti-Irish bigotry within their own communities. “In view of the political sensitivities surrounding linguistic and cultural policy issues, the actual proposal to introduce an Irish Language Bill is clearly divisive throughout our community. Sinn Féin President Gerry Adams said that, regardless of Poots’s decision “one way or another there will be an Irish Language Act”. “Edwin Poots, as Culture Minister, should have been long-sighted on this matter. He was in a unique position to show mature leadership. 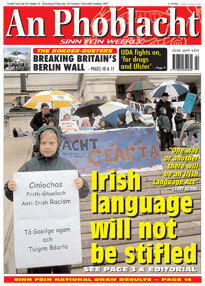 The Irish language threatens no one. It is not compulsory. Gerry Adams said that Sinn Féin has long argued for an Irish Language Act that recognises the rights of Irish speakers and this attempt to renege on this legislation will be challenged by Sinn Féin through the Executive. “It is with regret that the DUP and UUP have used this issue as a political football rather than an administrative subject. The last two weeks have seen attacks in the chamber on the language ad nauseum. “Irish language legislation is not a demonstration of strength by Sinn Féin, however, this morning is a clear sign of weakness by certain sections of Unionism.